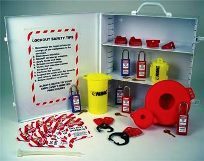 Lockout Stations are ideal for industrial settings in warehouses and work sites that need protection from electrical or mechanical energy. They can conveniently be hung on a wall for easy access. They should be kept well stocked at all times. Workers are more apt to adhere to a lockout program if the stations contain all of the contents to avoid electrical or mechanical discharge of energy. They should be visible and accessible for employees use.